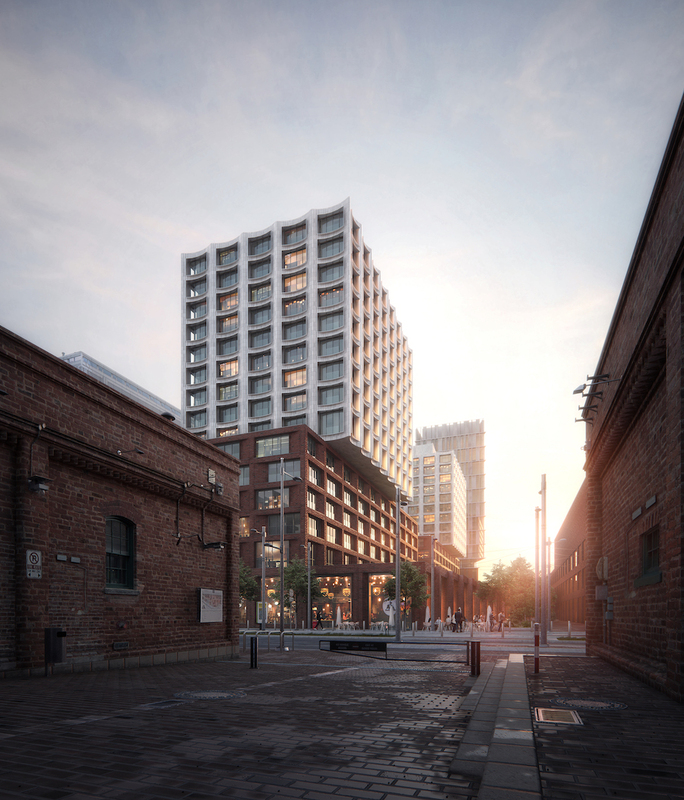 Danish architectural firm COBE will be leaving their mark on a new mixed use development in Toronto. 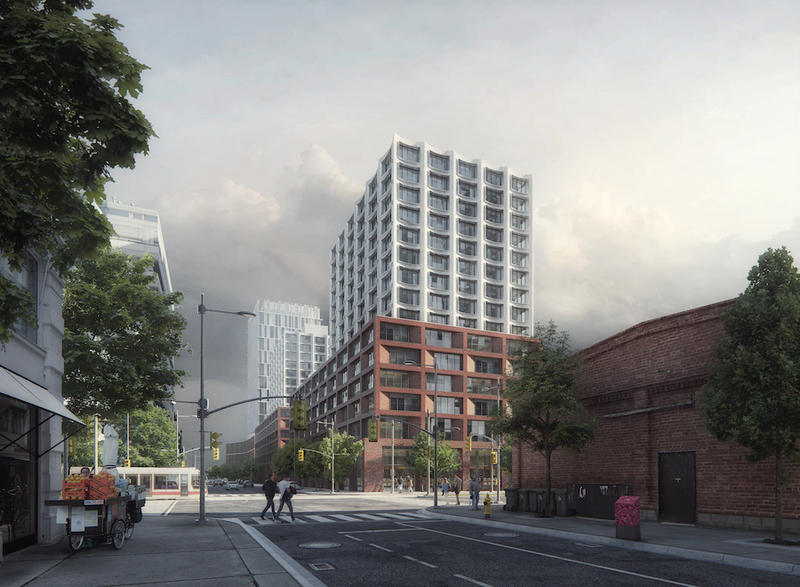 A client group consisting of Dream Unlimited, Kilmer Van Nostrand Co. Limited and Tricon Capital Group has commissioned COBE to develop a large scale mixed-use residential development in Toronto’s downtown east in collaboration with Toronto-based firm architectsAlliance. The project’s site is just south of the existing Canary District. Consisting of three buildings, two of which COBE has designed, the project contains 761 market rental apartment units, including 30 percent affordable rental units which are indistinguishable in their design. “We want to create attractive homes that appeal to many different types of people. We have been working alongside the client team to develop a concept of radical mixed use that provides all residents with a generous apartment, flooded with light through floor-to-ceiling windows, and access to attractive amenity spaces,” says Dan Stubbergaard, architect and founder of COBE. The new community is designed to achieve LEED Gold certification for sustainability where its future residents can live, work, play, shop locally, support local businesses and raise families. In addition, the development has the ability for its future residents to leverage many strong neighbourhood amenities in both the Canary and Distillery Districts, notably the 82,000 square foot Cooper Koo YMCA and 18-acre Corktown Common park. 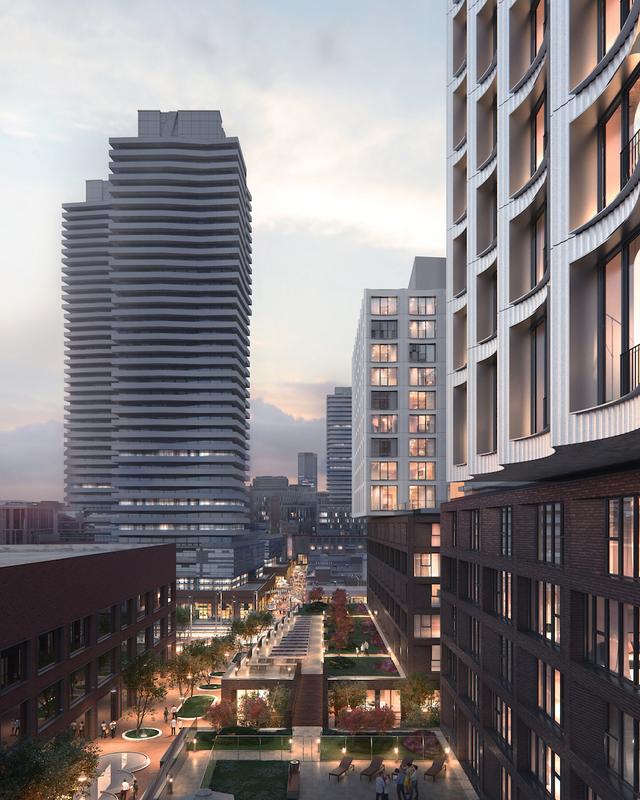 The site at the West Don Lands is located in a former industrial area on Toronto’s waterfront, which is currently undergoing a dramatic transformation. The site is at the intersection of three distinct neighborhoods, each dating from a different era and with its own unique architectural expression. The project stacks architectural components from the three neighborhoods like building blocks, one on top of the other. The first layer is a contemporary interpretation of the red-brick ware-houses of the adjacent Distillery District; the middle layer refers to the Canary District north of the site, with its mixed architectural palette, and the top layer is rendered in light concrete, inspired by the existing industrial silos on the harborfront. “Our vision has been to create a project that celebrates the area’s different styles in an inviting housing complex that both adapts to its surroundings and contributes by adding new distinctive and robust architecture to the city,” says Stubbergaard. To promote a high quality of life, the project gives all tenants access to communal amenity spaces. Terraces that result from the stacking of blocks are used to provide generous green out-door amenity spaces with urban farming, landscaped gardens, outdoor dining terraces, a playground and a pool area. “The goal is to ensure a strong sense of community across the different sections of the buildings. We would like to secure a project of high architectural quality with embedded social values, similar to what we strive for in Denmark with housing cooperatives and rent controlled apartments, where the residents have equal access to the amenities. We want to encourage a sense of community and connectedness,” says Stubbergaard. The three buildings are interconnected with a footbridge and underground connectivity. The center-most building contains amenity programs such as a cinema, fitness center, spa, music and childcare facilities, while each of the individual buildings contain local resident lounge and dining areas. At ground level, row houses are planned, each with a front door opening onto the public realm together with publicly accessible functions such as cafés and shops. In the public spaces between the buildings, designed by Montreal-based landscape architect Claude Cormier + Associés, there is room for urban life to unfold on open plazas, in intimate urban green spaces and on quiet pedestrian streets with room for children to play. Groundbreaking takes place mid-2019, and completion is scheduled for early 2022. The project is one of four that COBE is currently undertaking in North America.